Over the 2-parts, you will be covering the entire spectrum of The 9 Master Secretes to Professional Networking. Each attendee can have a copy of the latest edition of the 30 page illustrated training manual (see attached ). How to think like a genius and better communicate your value to others. I believe that responsible business leadership is the very essence of responsible citizenship and I’ll do everything in my power to support and promote ideas related to social entrepreneurship. To that end, we at Coach Powell Training and Development are dedicated to the development of tools and systems that help our clients maximize their focus and energy in order to perform brilliantly at their chosen endeavors. As, an author, lecturer, business coach and financial professional for more than eighteen years, I have created tremendous value for the best and brightest of Northern Virginia. Dedicated to providing business leaders with the professional attention necessary, I use my phenomenally successful proprietary coaching and training systems to help them achieve their business and personal development goals. 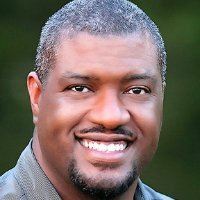 As Founder and CEO of Coach Powell Training and Development, I offer a unique variety of powerful products and services for personal and business development. Discover the magic of VisionQuest90™, TrueVOICE™, Coffee, Tea You and Me or, our new e-book The Power Play Book at our website www.ninetydaypowerplay.com.